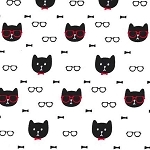 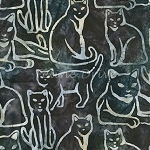 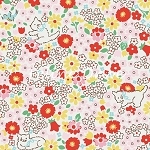 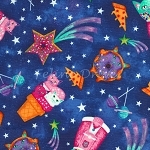 Looking for a smaller piece of cat fabric to complete a project or to add to your stash? 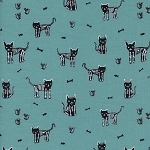 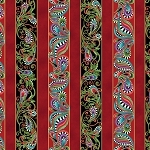 This is where you will find a variety of cat fabrics that are less than one yard in length. 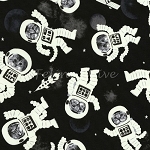 Collect a bunch at affordable prices, but don't wait too long, these pieces disappear quickly! 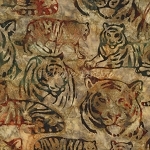 End of Bolt Piece - 9 Ghastlie Lives - Sebastian the Cat - Mauve - 17.5"
End of Bolt Piece - American Wildlife - Bobcats - 33"
End of Bolt Piece - Astrocats - Glow in the Dark - 17"
End of Bolt Piece - Astrocats - Sugar & Space - Cobalt - 12.5"
End of Bolt Piece - Atomic Tabby - Seafoam - 12"
End of Bolt Piece - Bats & Black Cats - Bone Appetit - Orange - 12"
End of Bolt Piece - Bed Time Rhymes - Royal - 17"
End of Bolt Piece - Bed Time Rhymes - Royal - 9.5"
End of Bolt Piece - Black & White - Cat Clique - White - 13"
End of Bolt Piece - Black & White Cats - 6"
End of Bolt Piece - Black Cats - 11.5"
End of Bolt Piece - Bluebird - Tiger Heart - 18.5"
End of Bolt Piece - Boo! 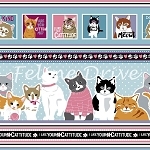 - My Pet Skeleton - 13"
End of Bolt Piece - Born Free - Lions - 17"
End of Bolt Piece - Calico & Company - Black - 13"
End of Bolt Piece - Calico & Company - Black - 17"
End of Bolt Piece - Calico & Company - Pink - 13.5"
End of Bolt Piece - Cat Faces - Pink - 11.5"
End of Bolt Piece - Cat Faces - Pink - 7.5"
End of Bolt Piece - Cat Lady - Friskers - Navy - 27"
End of Bolt Piece - Cat Lady - Pouncy Balls - 12.5"
End of Bolt Piece - Cat Lady - Stack-O-Cats - Mustard - 14"
End of Bolt Piece - Cat Lady - Stack-O-Cats - Mustard - 6"
End of Bolt Piece - Cat Nip Collection - Furball - 11"
End of Bolt Piece - Cat-finity - Grey - 8.5"
End of Bolt Piece - Cat-i-tude - Artist-O-Cats - Black - 14"
End of Bolt Piece - Cat-i-tude - Cats & Hearts - Black - 9"
End of Bolt Piece - Cat-i-tude - Cats & Hearts - White - 17"
End of Bolt Piece - Cat-i-tude 2 - Purrfect Together - Playful Cats - White - 12.5"
End of Bolt Piece - Cat-i-tude Christmas - Stripe - 16"
End of Bolt Piece - Cat's Cradle - Nite - 9"
End of Bolt Piece - Cats in Baskets - 20"
End of Bolt Piece - Cats on Quilts - Multi - 12"
End of Bolt Piece - Cats, Bats, & Jacks - Cream - 8"
End of Bolt Piece - Cats, Bats, & Jacks - Glow in the Dark - Orange - 11"
End of Bolt Piece - Cheryl Haynes' Crafty Cats - Cats on Dots - Blue - 22"
End of Bolt Piece - Cheryl Haynes' Crafty Cats - Packed Cats - Blue - 24"
End of Bolt Piece - Chi Chi Patches - Cat Toss - Blue Tonal - 11.5"
End of Bolt Piece - Christmas Cats - Cream - 13.5"
End of Bolt Piece - Christmas Cats - Cream - 15"
End of Bolt Piece - Christmas Cats - Cream - 27"
End of Bolt Piece - Christmas Presents - 9"
End of Bolt Piece - Christmas Time - Kitty Kristmas - Hunter - 13"
End of Bolt Piece - Daddy & Me - Paw Prints - Black - 7.5"
End of Bolt Piece - Daddy & Me - Paw Prints - White - 13"
End of Bolt Piece - Dan Cats - 4"
End of Bolt Piece - Dapper Cats - 10"
End of Bolt Piece - Day Dreamers - Birds - Blue - 6"
End of Bolt Piece - Day Dreamers - Birds - Yellow - 7.5"
End of Bolt Piece - Day Dreamers - Mouse Plaid - Black - 10"
End of Bolt Piece - Day Dreamers - Paw Prints - Black - 10.5"
End of Bolt Piece - Day of the Dead Kitty - 14"
End of Bolt Piece - Dear Little World - Kittens & Music - Dark Pink - 15"
End of Bolt Piece - Dear Little World - Tossed Cats - Yellow - 14"
End of Bolt Piece - Dear Little World - Tossed Cats - Yellow - 27"
End of Bolt Piece - Doodlebug Paws - Red - 12"